Lawrence Van Lingen is the ART specialist at Rausch Physical Therapy & Sport Performance. He’s worked with Red Bull athletes, IRONMAN champions, and he can work with you, too. Lawrence Van Lingen, ART Specialist for the Pros… and you, too! When you first walk into Rausch Physical Therapy & Sports Performance you’ll notice a wall of glass to your right. Behind the very last door, emblazoned with the words “Clinical ART,” is where Lawrence Van Lingen works. The room is small with bare walls, save for a few pieces of art, and it only contains a small desk and treatment table. It is… remarkably unremarkable. In fact, if it weren’t for the familiar face of a pro athlete popping in and out of that room every once in a while, you’d never suspect that the man inside of it was anything other than your average massage therapist. The truth is, Lawrence is far from average; he’s a well-respected, highly sought after soft tissue therapist and performance consultant. His elite clients travel across the country—some even across the world—to visit his humble office hidden in the corner of Rausch PT. So who exactly is Lawrence Van Lingen, why are professional athletes traveling from the other side of the globe to come see him, and most importantly, how can you get on his schedule, too? Lawrence working on Josh Bryceland, professional downhill mountain biker and Santa Cruz Syndicate Team Racer, at the World Cup in Scotland this past summer. More than 20 years ago in his home-country of South Africa, Lawrence was highly involved in triathlon when he decided to become a sports chiropractor. His first clients were triathletes and his wife Gwen, an Olympic runner. 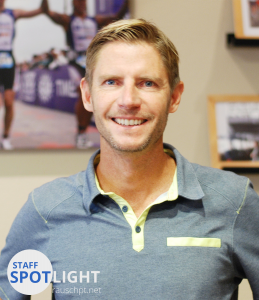 Soon, word began to spread about the man with the magic touch, and Lawrence became the team chiropractor for a number of professional lifesaving, running, swim and triathlon teams. It wasn’t until Lawrence himself competed as a professional IRONMAN for two years that his personal interest in sports performance began to creep into his chiropractic career. In 2013 Lawrence became High Performance Manager of Red Bull South Africa, working closely with the best professional endurance, adventure extreme sport athletes around. In this case, it was Lawrence who was gone; at the end of 2013 his wife took a job in the U.S., and Lawrence started his professional life over again as an ART specialist at Rausch Physical Therapy & Sports Performance. Lawrence says the team atmosphere and holistic approach Rausch PT offers its patients is what drew him in. 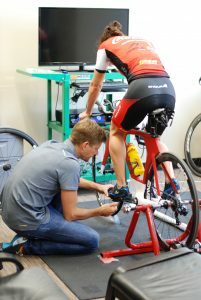 Lawrence performing a bike fit consultation with professional triathlete Rachel Joyce in May. Rachel came for ART with Lawrence after a serious foot injury; just last week she placed second at IRONMAN World Championship. Lawrence still treats professional athletes these days. He works with the Santa Cruz Syndicate, one of the most well known professional downhill mountain bike racing teams, and endurance athletes travel from far and wide to get treatment from and consult with him. However, Lawrence says that ART isn’t just for elite athletes. In fact, you don’t have to be an athlete at all to hop on his schedule and feel the amazing benefits of soft tissue release. Rausch PT physical therapists will often refer their patients to Lawrence if they have restrictions or soft tissue adhesions that need some extra special attention, and thanks to Rausch PT’s holistic care, Lawrence can refer patients back to physical therapy for continual care. Our athletic patients can take advantage of having access to the pros’ “secret weapon” and call in to get on his schedule for performance-enhancement purposes. No matter who you are, how old you are, or what level of activity you’re at, Lawrence Van Lingen is waiting in that little corner office to help you get some release.